Thirty-six men from 11 cities representing 2,000 members of carpenters’ unions and trade organizations from throughout the United States met in Chicago and on August 8, 1881, and formed The Brotherhood of Carpenters and Joiners. Peter McGuire, a young carpenter who had organized carpenters in the St. Louis area, was elected General Secretary. Under McGuire’s leadership, The Brotherhood absorbed many rival unions and, as a condition in one of its mergers, added the word “United” to its name. By 1890, the United Brotherhood of Carpenters and Joiners was the largest trade union in America. During the 1890s, the UBC played a major role in the struggle for an eight-hour workday. The UBC was also instrumental in the establishment of Labor Day as a national holiday. 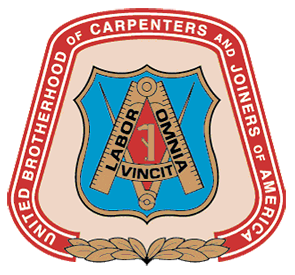 Today, the United Brotherhood of Carpenters and Joiners is one of North America’s largest and most powerful labor unions. Boasting more than a half-million members, the UBC is a powerful political and economic force, and provides a variety of high-quality training programs to its members. Florida Carpenters Regional Council is an affiliate of the United Brotherhood of Carpenters and Joiners of America, composed of 6 individual local unions and approximately 3,000 members. Many of the local unions in the FLCRC were founded more than a century ago. Interested in learning more? Click here to download a more detailed look at the history of our Union from our member handbook. What do the parts of the emblem signify?